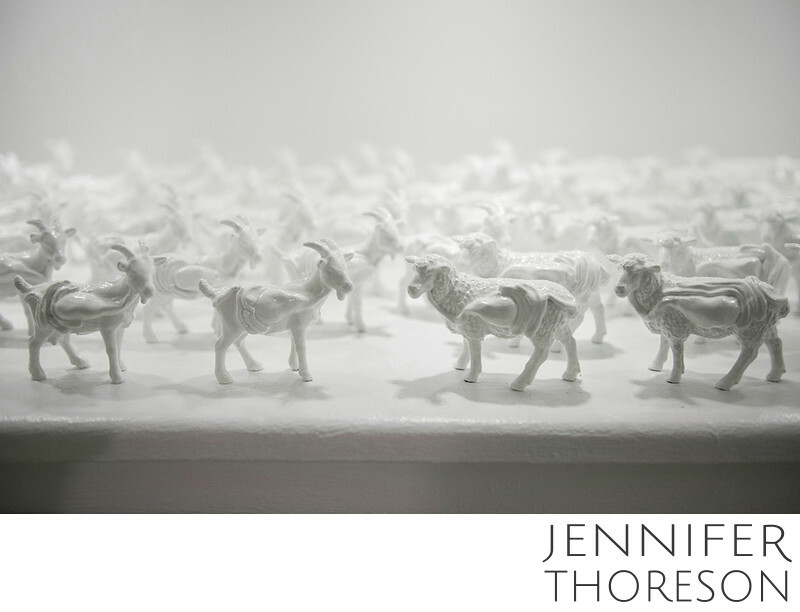 This image is a close-up of the installation of white resin goats and sheep, which occupied the telephone shelf at the end of the main hallway. Each figure displays a stomach and intestines outside it’s body, each formed from taxidermy clay and coated in white resin. The stomach and intestines resemble that of a human rather than the animal, illustrating the Biblical reference to human beings as goats and sheep, particularly in Jesus’ parable found in the book of Matthew. Historically, sheep and goats are frequently herded together. Sheep are docile, gentle creatures, whereas goats are unruly and can easily upset the sheep. Because they do not feed or rest well together, the shepherd often separates them for grazing and for sleeping at night. In the parable, Jesus states He will put the sheep on Hisright, the place of favor and blessing. The goats He will put on the left, the place of disfavor and rejection. For me, this installation represents human nature, our blindness, impressionability, and vulnerability.